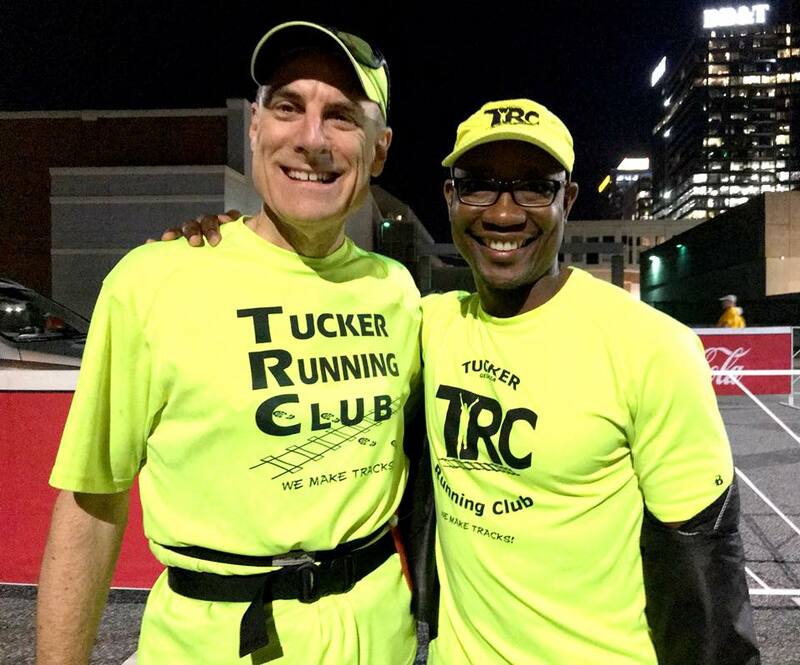 Since the beginning of September, I've joined Tuesday evening group workouts with Coach Carl Leivers. Several friends have worked with Coach Carl, with excellent results, and so I decided to dip my 10 toes into receiving some coaching. The September workouts were tough, not only with the evening heat but I was running the first part of each workout too hard, having difficulty completely the prescribed workout. But starting with a hill workout a few weeks ago, in which we were to run each 60 second hill repeat just a little further than the previous one, I successfully paced myself to finish the workout strongly. In last Tuesday's workout, we ran 16 x 400 m repeats with 75 second rests between each lap. The goal was to finish each lap in 1:55 - 2:00 minutes. For the first five laps, I was lagging behind the rest of the group - but I was hitting each lap in the prescribed time, between 1:55 and 1:59. 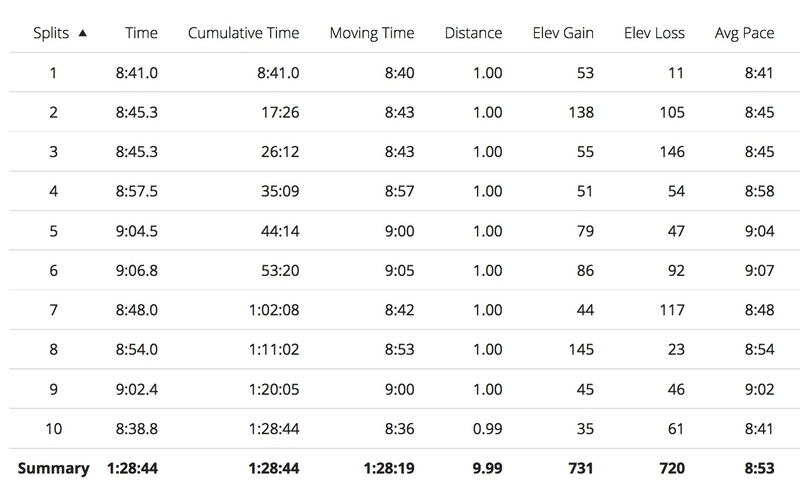 As the workout progressed, my legs were feeling good, so I started pushing myself to run just a second faster with each lap, running laps 6 through 12 between 1:49 and 1:54. Lap 15 was completed in 1:44, and then I sprinted through the final lap at 1:37. It was a great confidence builder to gradually increase speed and to find the high gear at the end of the workout. Thanks Coach Carl! 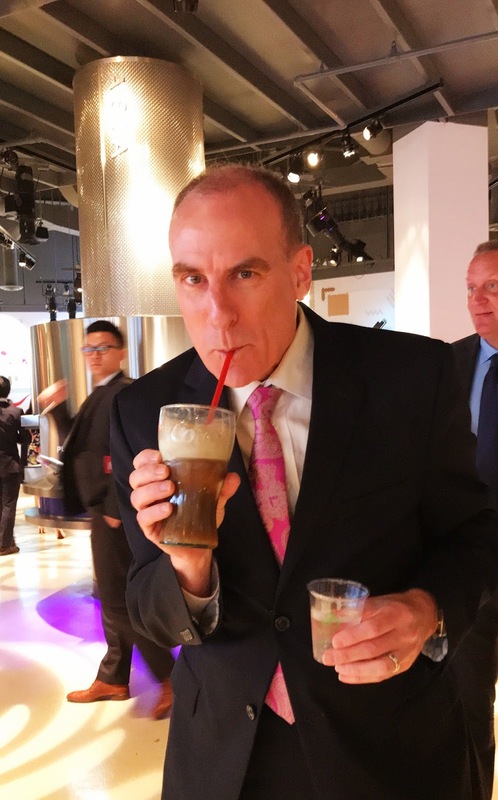 root beer float in the right hand. On a less positive note, my weight is up about 5 pounds from the ideal. I've been tracking on the Weight Watchers program, but then something trips me up - this week it was my father-in-law's birthday cake, of which I had a bit more than just a taste. Last night Bonnie and I attended Chopstix for Charity, at the World of Coca-Cola. It was a great program, and I ate judiciously and lightly. 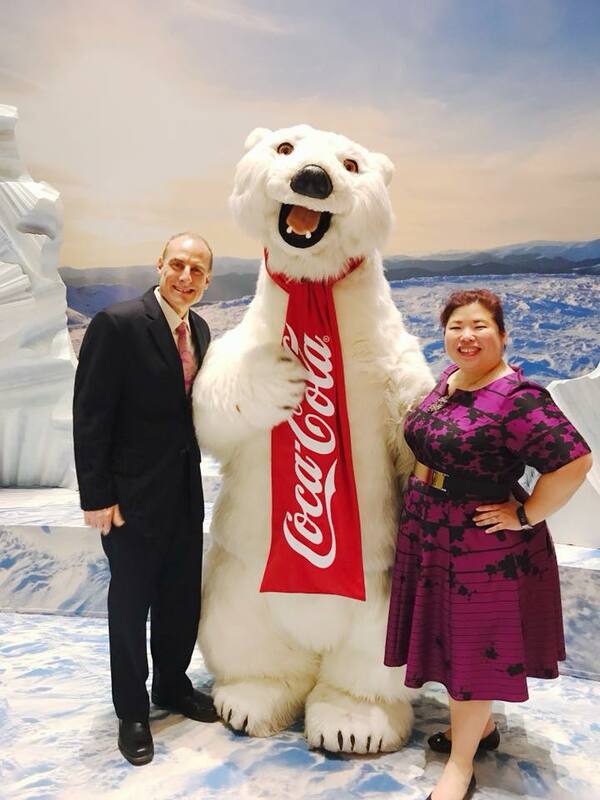 That is, until the end of the evening, when the Coca-Cola tasting room opened for the final hour of the program. My undoing was a delicious root beer float - I hadn't had such a treat in years! 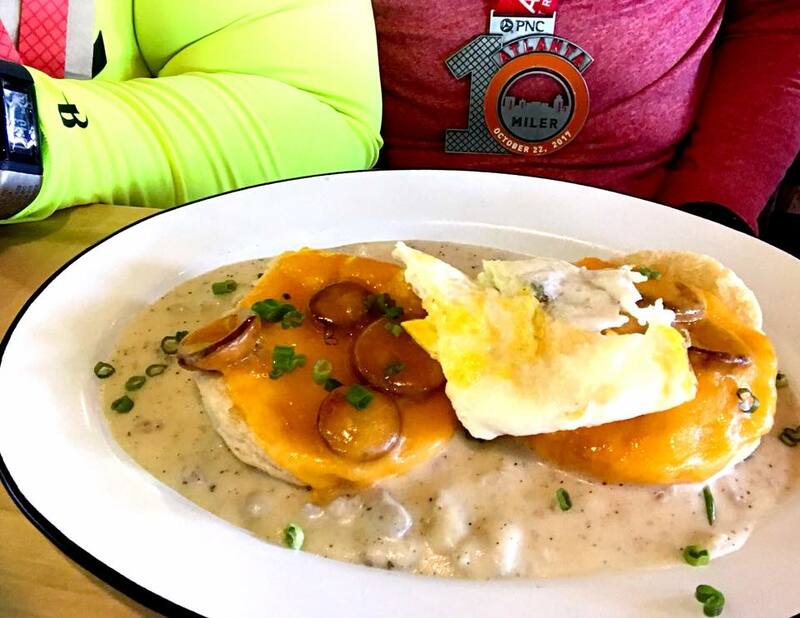 I jokingly called it pre-race "carbo-loading" but could not recall reading about that kind of carbo-loading in any of the many training plans that I have studied. Oh well. At least we went to bed before midnight. As is often the case on race days, I woke up spontaneously a few minutes before the alarm sounded, which this morning was set for 4:30 am. I dressed in my race kit, ate a healthy breakfast of oatmeal and blueberries and one cup of instant cappuccino, and stretched my legs on the foam roller. At least I had hydrated properly throughout the day before, and had also worn compression stockings for much of the day. We arrived at Atlantic Station around 6 am, getting a good parking spot in the garage and among the first to arrive for the Tucker Running Club photo op at 6:30 am. The temperature was cool, in the mid-50's, and I was comfortable in the short-sleeve shirt that I had chosen for today's run. I was initially concerned that I wouldn't have enough time to properly warm up, but with the first steps, my legs felt really good. I was satisfied with just a bit more than a one-mile warmup, then found my way into the middle of wave B for the start. A moment before the official beginning of the race, Beverly Ford and Brian Minor joined me in the corral. They were going to run the race at an easy pace, having finished the Chicago Marathon two weeks ago, just wanting to finish all of the Grand Prix races of the Atlanta Track Club. 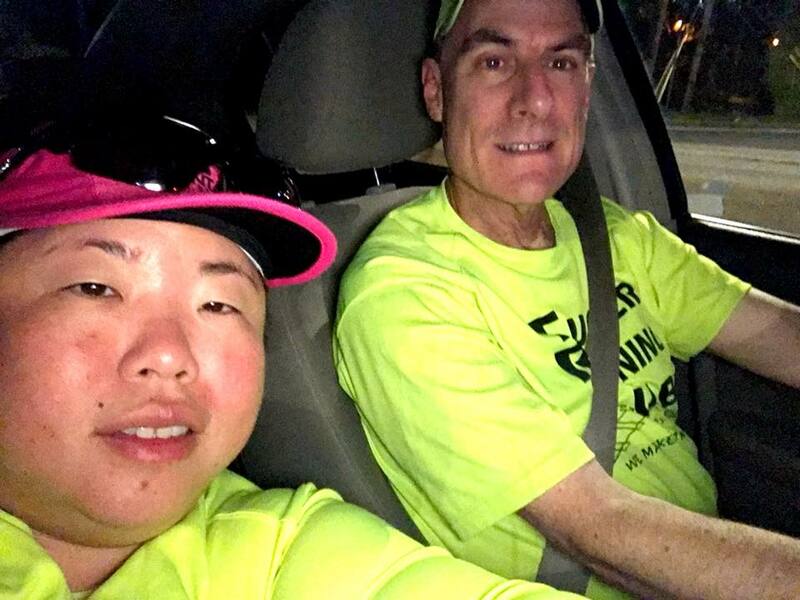 Right before we started the race, Brian asked me what was my goal, and my response "To beat last year's personal record, 1:28:40!" Brian promised "If you break your PR, breakfast is on me!" Those words propelled me for the next 20,000 steps! Brian provided positive motivation leading to a strong performance! I crossed the starting line just under 3 minutes after the official start, and quickly settled into my plan for the beginning miles, just under a 9 min / mile pace. Sunrise was still 25 minutes away, and although the sky was beginning to grow light, I had to watch carefully to avoid the occasional divot on the road. On the new route, we had the east-bound three lanes of 17th Street out of Atlantic Station, encouraged by the Atlanta RollerGirls team, always one of the most enthusiastic cheer groups in this race. I had set my watch to a 4:00 run / 0:30 walk interval, and forced myself to take the first walk break shortly before reaching the 17th Street bridge across the I-75/I-85 connector, moving into the west-bound lanes. After we crossed the bridge, our path narrowed to just one lane of the road - and the sidewalk, which took half of the runners. That was a bit too narrow for such a large group in the first mile of the race. It was a relief to make the left turn onto Peachtree Road, onto which we now had all of the northbound lanes. Mile 1 was completed in 8:57. The next mile was gentle rolling hills, but mostly gentle downhill, crossing I-85 on the PEACHTREE bridge, and I managed to pick up a little speed. Running buddy Myriam Fentanes passed me during one of the walk breaks, and I figured that I would catch up with her when I resumed running, so I picked up my speed a bit, finishing mile 2 in 8:20, 17:17 elapsed. With Rob Gee, also attending Chopstix for Charity. About 1/4 mile before reaching the mile 2 marker, the Conquer Cardiac Hill challenge began, as we crossed a timing mat. This was advertised as being downhill, but in fact the first section was noticeably uphill. I resolved that I wasn't going to try to set any records heading downhill: I knew that I didn't have a chance to be one of the top 100 runners down the hill, and I didn't want to spoil the rest of my race by trying for an impossible pace. At the two mile mark, we finally began heading downhill. It felt like a gentle grade, and I continued taking walk breaks on occasion, either as scheduled or at water stops. I was carrying a bottle of Nuun on my water belt but took a cup of water or Gatorade at each hydration station, resolving not to let myself get dehydrated after seeing the distress of some of the other runners in the Boston half marathon a couple of weeks ago. I finished the Cardiac Hill challenge in 8:12, running it at consistent effort. 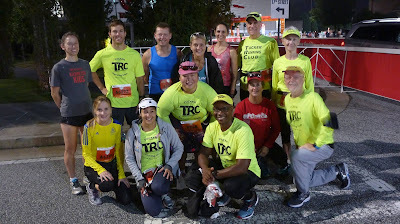 We turned onto Peachtree Hills Avenue, encountering the first significant hills of the route, even before reaching the mile 3 marker in 8:35, 25:52 elapsed. 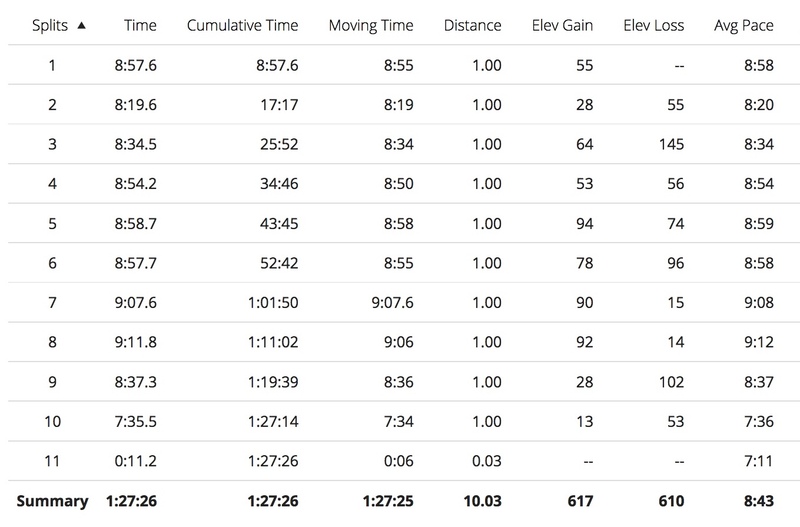 That felt a little slow to me, but I knew from last weekend's reconnaissance that the next five miles would be hilly. I had never managed to catch up with Myriam, and lost sight of her for the rest of the race. However, my legs were feeling good, and I was able to power up the hills at a decent pace, finishing mile 4 in 8:54, 34:46 elapsed. I took my first of six shot blocks at this point, resolving to take one at every mile marker for the rest of the race. Looping onto Lindbergh Drive, we turned onto Garson Drive, made a right turn onto Piedmont Road, passed under I-85, and then headed up a long hill toward Midtown Atlanta. At the mile 5 marker, there was a timing mat, which I crossed at 43:45 elapsed on my Garmin (43:40 chip time, finishing mile 5 in 8:59). Halfway done, I multiplied by 2 to get 1:27:30, well under the time that I would need for the free breakfast! Despite the length of the hill, the prospect of breakfast motivated me to run mile 6 in 8:57. I recognized Sam Benedict ahead of me: he is one of the age 70 runners that runs about my pace. I was delighted to pass him, but he was having a steady conversation with the runner next to him about judicial appointments, whereas I was not able to spare the breath or the intellectual energy to think about anything more than taking a shot block every mile. By this stage, I was beginning to ignore the watch, running more by feel, stretching out the run sections in some cases to 5 - 6 minutes, walking through each water station. The scenery was getting nicer as we approached the Botanical Gardens, even though I had to work to get up the hill at a steady pace. Turning into the garden, a volunteer said "Not much further!" I smiled at him, and he corrected himself "More than halfway there!" 6.4 miles elapsed, 3.6 miles to go, to be precise. David Bloomquist passed me during a walk break in the entrance to the Botanical Garden, but I managed to catch up and pass him a moment later running downhill into Piedmont Park. Every time I looked at my watch, my pace was slower than 9 min / mile. The dreadful thought of losing the free breakfast encouraged me to run a little faster. 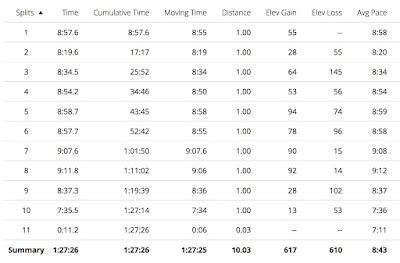 Nonetheless, I needed 9:08 for mile 7, 1:01:50 elapsed. Turning out of the park, there was a water station at the bottom of the 12th Street hill. That was perfectly placed for a 30-second walk break as I sipped down a cup of Gatorade. Returning to a run, I made good time up 12th Street. I was nearly at the top of the intersection with Juniper before I really began to feel winded. 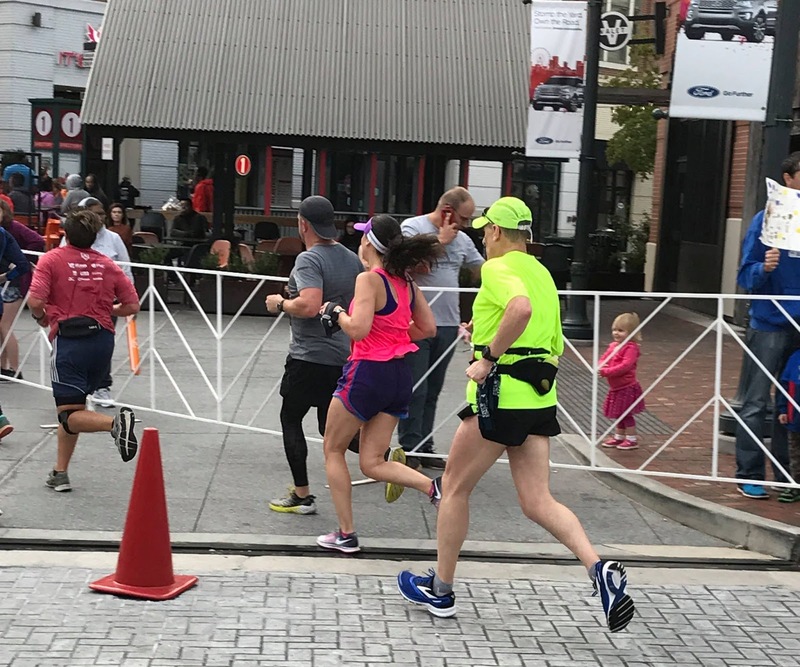 Although the southbound stretch on Juniper Street was mostly uphill, this was familiar ground from the Hotlanta Half and the Georgia Half Marathon. It didn't take long to count down six blocks to the intersection with 6th Street. This was the highest elevation of the race! And I was still in decent shape. Around the intersection with Peachtree Street, we passed the mile 8 marker, 9:12 for mile 8 and 1:11:02 elapsed. Doing a quick calculation, two 8:50 miles would likely earn me that free breakfast! That spurred me to speed up as I made the right turn onto West Peachtree Street. We finally had multiple lanes of the roadway, and could spread out a bit. 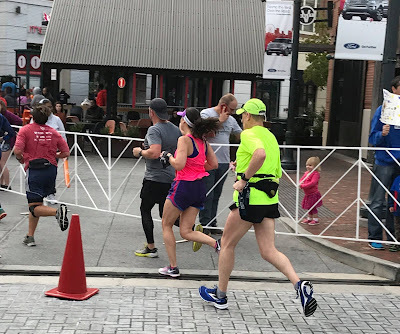 The only problem was that the increase in elevation at 10th Street, which I had dismissively referred to as a "speed bump" in my blog post on last weekend's race preview, was much more substantial than I had remembered. The road seemed to loom high into the sky as we approached 10th Street. (Apologies to any readers who were surprised after reading my previous post!) Nevertheless I wasn't going to let the free breakfast slip away. I pushed myself over 10th Street and then enjoyed the downhill section to the mile 9 marker, 8:37 (success for mile 9!) and 1:19:39 elapsed. If the finish line was exactly 1.00 miles away, then I only needed to run precisely 9:00 minutes for that last mile to break the PR, and Brian would buy breakfast. But knowing that the mileage might be just a tad bit longer than my Garmin, I didn't risk it. HAMMER TIME, I told myself! Turning onto 17th Street, the overpass was a substantial increase in elevation, but breakfast was drawing me up the overpass. At the top, a volunteer told us "That was the last hill! The rest of the race is level!" Fortunately having run the route last weekend, I knew that he was absolutely correct. I was amazed to see some of the finishers walking the other way: how many people had already finished 10 miles?! It was only when writing the blog that I realized that some of them were undoubtably 5K runners. Further increasing my speed, I began gaining on runners ahead of me, and then passed them strongly. I saw marathon training coach (and 2008 Olympian) Amy Begley on an ElliptiGo on the sidewalk, and I called out "Coach Amy!!" She smiled, and I took off even faster, showing off for the coach. I continued making progress on runners ahead of me, drawing even with a young woman in the last 100 yards of 17th Street. She sped up to get ahead of me, but pushing myself a little faster, I caught up with her. Making the right turn onto State Street, I pulled ahead for good. My watch was reading 9.80 miles, but I felt that I had more than 0.20 miles to go. I ran even faster, not wanting to miss the free breakfast just because I might have wandered a bit instead of running the tangents. This stage of the race route was lined with spectators, as in past years. They encouraged me to keep running as fast as I could. Before I knew it, here was the final right turn at the Pig and the Pearl restaurant, and the finish line banner. I put on one final sprint, passing yet another runner coming into the finish, seeing 1:30:15 on the clock. I was delighted to cover the last mile at a sub-8 min / mile pace. The training with Coach Carl is paying off! Crossing the finish line with a few long fast strides, turning off the watch 1:27:25, I allowed myself a fairly big celebration, as I gradually slowed to a walk! A new personal best!! And a free breakfast!!! Myriam also ran an outstanding race, finishing under 1:25, with a 9 minute improvement over last year's 10-miler. 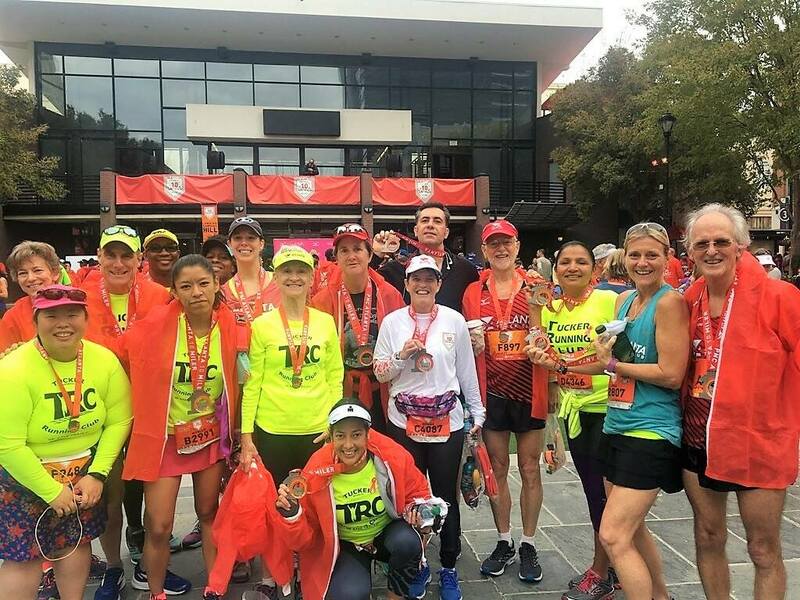 Many happy runners and personal records in today's post-race photo! 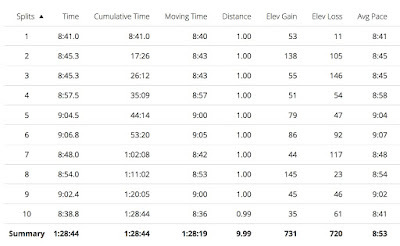 Despite the new route, which I had felt might have been hillier than in past years, several others in my circle of runners also ran personal bests today. I realized when I downloaded the Garmin data this afternoon, I could compare total elevation gain/loss with last year's route, and get a good sense of which route was more challenging. 2016 stats (top); 2017 stats (bottom). this year's race route was not as hilly. After many celebratory post-race photos, Bonnie and I, Brian and Beverly, and Myriam and Roberto, headed to a restaurant about one mile away from Atlantic Station, Holler and Dash Biscuit House, on Howell Mill Road. There was a long line, at least half of the patrons were sporting race medals and/or race shirts, but it didn't take too long to get to the counter. Brian graciously picked up the tab for a delicious breakfast of Andouille Hustle, with andouille sausage, cheese and scallions topping a biscuit in a shallow pool of delicious sausage gravy, with a fried egg on top, hot coffee, and a basket of beignets to share for the table. Before leaving, Brian and I established our next breakfast bet: winner of the Jeff Galloway Half-Marathon buys! It will be Brian's first running of the JG 13.1, so he considers it my "home course". Fact is, Brian will likely finish that race 10 minutes before me. Bonnie joked that "you should just give Brian the $20 now", but I hope that the bet will motivate me to try for a new half-marathon personal best. Stay turned for December 17!